I am not a very competitive person unless you dare me to cook something that you have eaten somewhere. “You could cook this couldn’t you?” is almost like waving a red flag at a bull. That’s how I ended up making this dessert. The Hensen Hotel in Marrickville. is the inspiration for this dessert. My gluten free friend raved about it, she ate it when she went for dinner a couple of weeks ago. This made it necessary for us to have to go back to the Hensen Hotel for dinner again so I could try it. 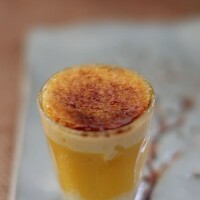 That’s when the words were uttered and hence I have made my version of the Lime and Mango Brulee Trifle. 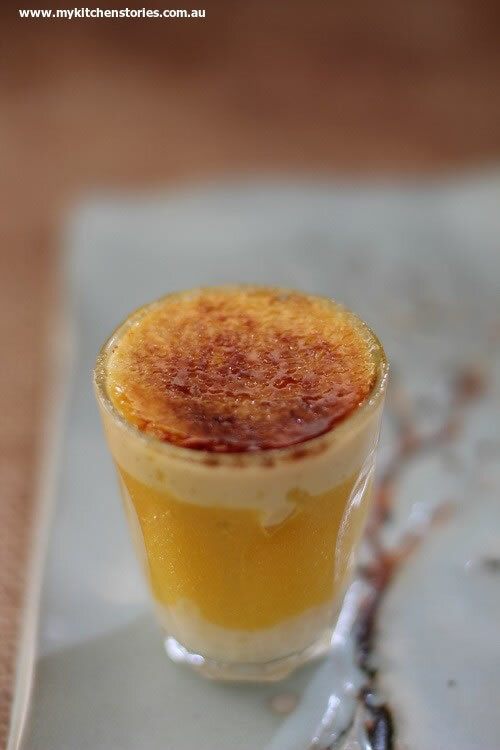 The bottom sports a creamy tapioca vanilla base layered with a lime mango jelly with dice of mango and then a brulee top. 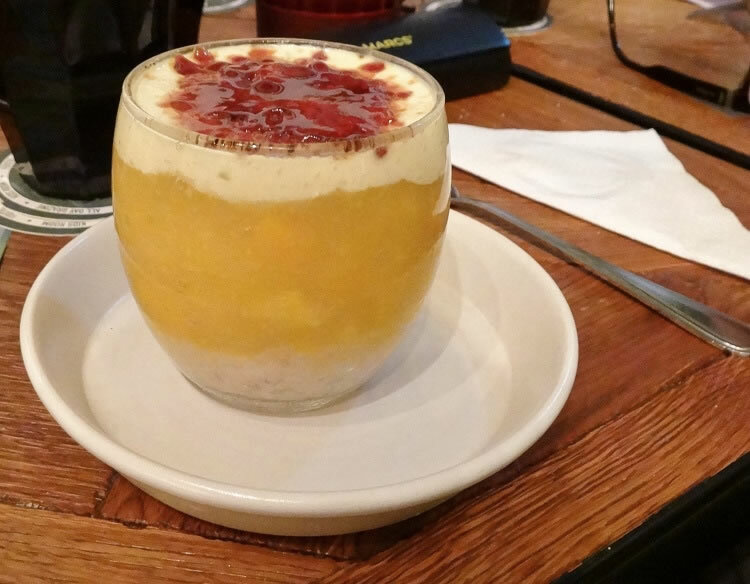 It’s the perfect mix of creaminess and fruit and the added excitement of tapioca. This is a couple of layers worth of work but it is really a great dessert because it can be made ahead of time. 1 whole mango deseeded and chopped. 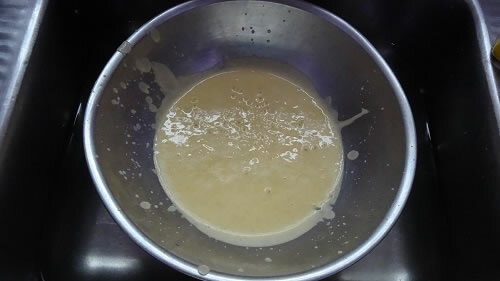 Put the tapioca in a small pot with the milk sugar and vanilla and bring slowly to the boil. Turn down low and simmer ( approx 10 minutes). 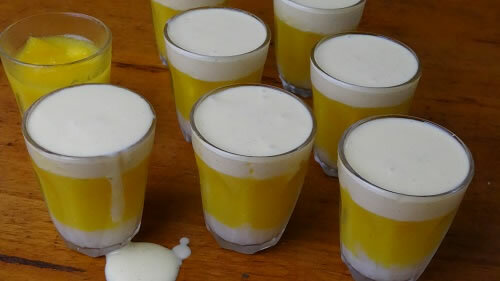 The Tapioca will look opaque and will be both soft and a nice and creamy consistency. 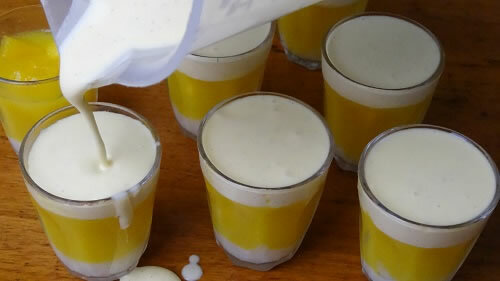 Spoon a small amount into each glass and put onto a tray and put into the fridge to cool. Put the lime into a small pot with the sugar and bring to the boil. Take off the heat and when it is just warm add the gelatine and stir through. To make the brulee mix. First prepare a bowl in a sink of cold water to cool off the custard once cooked. Put 5 egg yolks into a bowl that can be put over a pot of hot water (a double boiler). Put the vanilla and sugar into a bowl and mix with a whisk for several minutes. Add the cream and mix again. 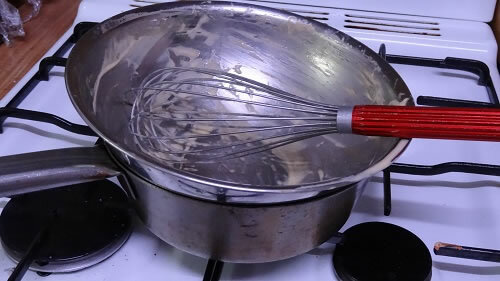 Using a whisk mix over a pot of simmering water until thick. Don't let it get too hot. Pour the thick custard into the bowl sitting in cold water. Cool till cold and pour into the glasses up to the top . 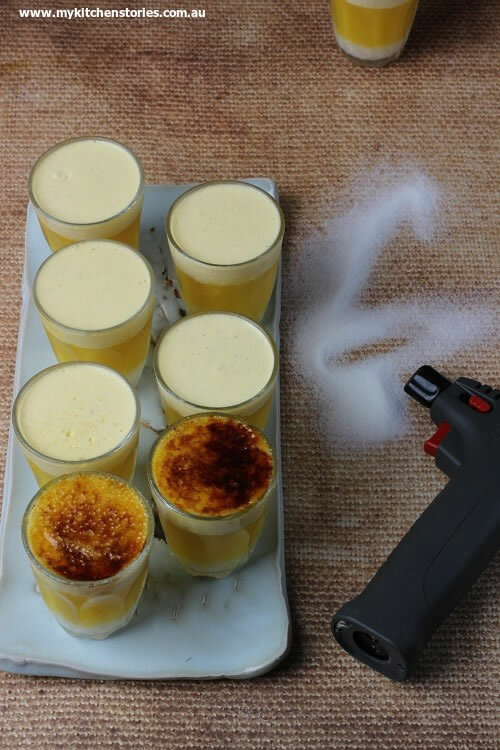 To serve cover the top of the glass in caster sugar and scorch with a brulee gun. Hehe so if we ask you that question, will you make us something? 😉 I’m not kidding, your food is always so delicious T! I love the look of this dessert! What’s not to love? 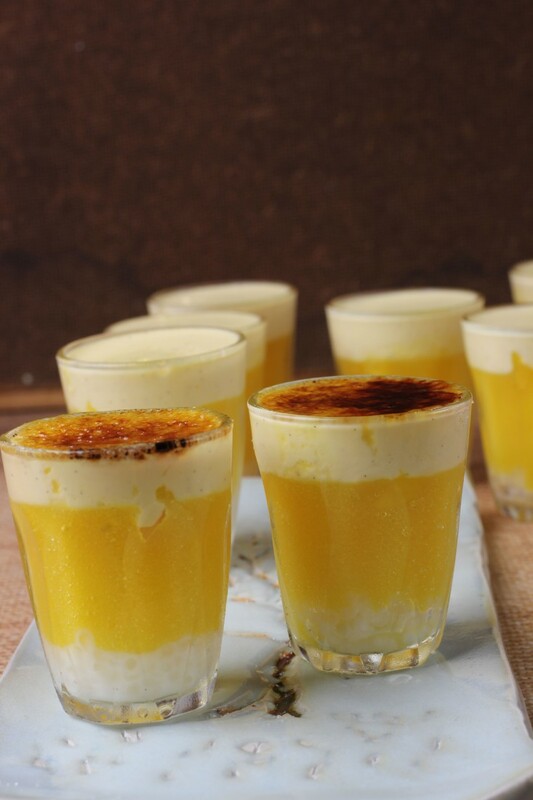 Mangoes, trifle, and Brulée. Win, win, win. Wow! I’m in on anything that needs a torch. What is it about a kitchen torch that makes women love playing with fire? Your desserts are definitely heavenly. OH and they were lovely. It sounds like a winning combination Tania! Definitely worth all the efforts! These trifles look divine! Love the layers Tania, it looks divine! I’m impressed you were so determined to get it right- and you seem to have nailed it for sure! I’ve never baked with tapioca before but I’m ready to give it a go. This looks amazing and I love an excuse to use my torch. Happy to have found you through YBR!